The Dow closed down 5.45 at 13,422.28 and the Nasdaq closed up 3.02 at 2608.37. Transports closed up 3.59 at 5133.36. Total volume on the NYSE was below average trading 1.48 billion shares. U/down volume was 1.16 to 1 positive, Nasdaq up/down volume was 1.14 to 1 positive. Sept. E-mini S&P futures closed down 1.75 at 1517.25 and the Nasdaq 100 futures closed down .25 at 1955.25. Sept. E-mini S&P futures total volume was average trading 1.37 million contracts. Sept. 30 Yr. T-Bond futures closed down 0-06 at 106-30. August Oil futures closed up .60 at 69.57 and August Natural Gas futures closed down .43 at 6.66. August Gold futures closed up 5.40 at 650.20 and July Silver futures closed down up 0.169 at 12.505. Grains were mixed with Sept. Wheat up 2 ¼ cents at 6.23 ¾, Nov. 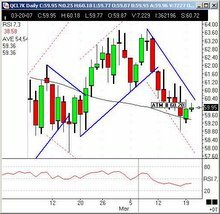 Beans closed up 5 ½ at 8.43, and Dec. Corn closed down 3 ¾ at 3.58 ¼.
August Live Cattle futures closed up .90 at 90.15 and August Feeder Cattle closed up 1.200 at 109.775. August Lean Hogs closed down .10 at 71.55. AS I SEE IT: The strong up-move that started yesterday continued today into the FOMC Announcement at 2:15 ET. The Fed left interest rates where they were, but the market usually gyrates wildly after these announcements are made as traders look for any changes in the language. The market high came right after the announcement, and the low came at the close. Sub-prime loans are a worry, and many traders are waiting for the next shoe to drop. However, this is the end of the quarter and window dressing is in full swing. First support in the S&P futures will be in the 1514.00 area tomorrow morning. Day-trading profits were good here at Soaring Phoenix today, but day’s like yesterday spoil us when we have average results. Have as much fun trading as I do. Order The Long Term E-Book! Mr. Ray Olson is the Author of the Market Strategies Workbooks. He has been trading for over 40 years, and his insights are priceless. 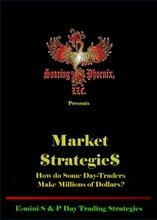 Besides trading the Soaring Phoenix accounts, he publishes the Newsletters and teaches others how to trade. 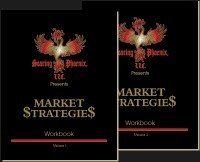 We want to give everyone the opportunity to "Trade Like A Pro" with the Soaring Phoenix Market Trading Strategies workbooks and free newsletter. Even though these market trading strategies can be used in any market with enough volume to create movement, we specialize in teaching brokers/traders to trade the E-mini S&P, Nasdaq 100, 30 yr. T-Bonds, Gold, and the Oil market futures. Our Instructor, Mr. Ray Olson, Senior Trader for Soaring Phoenix LLC accounts, and the Author of the Soaring Phoenix Market Trading Strategies has traded for 40 years and is one of the best traders in the country. We are fortunate to have him trade for Soaring Phoenix, and help others learn how to trade with the profit probabilities on their side. We offer everyone the opportunity to learn more about our market trading strategies by sending them FREE, a daily newsletter with market comments and charts. We also send ATM (Active Trading Momentum) numbers for 60 days, so students can get an idea what these market trading strategies can do for them. If you purchase the Workbooks, Mr. Olson is available for his students to give them further instruction. trade ever; I can't thank you enough for this." and grasped the simplicity of the system." money after a 4 year struggle." Add Your URL FREE, Boost Your Web Site's Traffic & Rankings.